Written in the context of unprecedented dislocation and a global refugee crisis, this edited volume thinks through photography’s long and complex relationship to human migration. While contemporary media images largely frame migration in terms of trauma, victimhood, and pity, so much more can be said of photography’s role in the movement of people around the world. Cameras can document, enable, or control human movement across geographical, cultural, and political divides. Their operators put faces on forced and voluntary migrations, making visible hardships and suffering as well as opportunity and optimism. Photographers include migrating subjects who take pictures for their own consumption, not for international recognition. And photographs themselves migrate with their makers, subjects, and viewers, as the very concept of photography takes on new functions and meanings. Photography and Migration places into conversation media images and other photographs that the contributors have witnessed, collected, or created through their diverse national, regional, and local contexts. 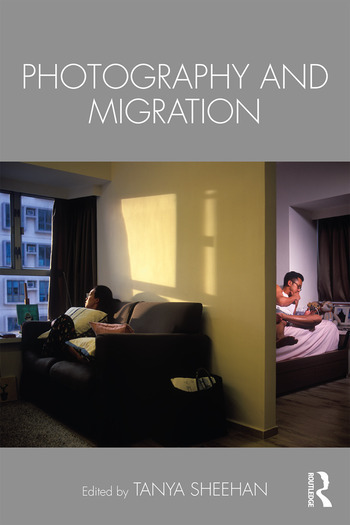 Developed across thirteen chapters, this conversation encompasses images, histories, and testimonies offering analysis of new perspectives on photography and migration today. Tanya Sheehan is the William R. Kenan, Jr. Associate Professor of Art at Colby College, USA, where she founded the Photography and Migration Project in 2014. She has authored two books, Doctored: The Medicine of Photography in Nineteenth-Century America (2011) and Study in Black and White: Photography, Race, Humor (2018). She has also edited several collections of essays, including Photography, History, Difference (2014), Photography and Its Origins (2015, with Andres Zervigon), and Grove Art Guide to Photography (2017). Since 2015, Tanya Sheehan has served as editor of the Smithsonian Institution’s Archives of American Art Journal.